I’m a Questioner by nature, so I rarely do things just because others are. 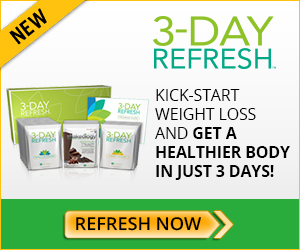 Most of my Beachbody friends tried the 3 Day Refresh ages before I did, but it took me awhile to come around to trying it. Why Did I Decide To (Finally) Try The 3 Day Refresh? I do well with healthy eating and working out when I’m at home and things are running on my normal schedule. What can I say? I’m a girl who likes my routines. Which is all well and good, until you come back from a long weekend trip, and two weeks later your jeans don’t fit. Oops. So I really needed something that would kick me back into gear, and get me going again. And I decided that it was well past time that I tried out this mini-program and gathered my thoughts about it. So here you have it folks…after all this time, I am finally getting around to my 3 Day Refresh review (pause for dramatic music). I was skeptical up front about the number of shakes to drink, since I’m primarily a whole foods girl. This turned out to not be a problem when I actually did it, but it was definitely a hurdle to me actually opening up the box and getting it done. The first day was the hardest for me, and it took some willpower to move on to day two. If you have ever done a cleanse, or even gone cold turkey on caffeine or sugar, you’ll know the feeling that was hardest for me on the first day – there were some killer headaches, and I may have wasted a decent amount of time fantasizing about giant bacon cheeseburgers. I chose to look at the headaches and carnivorous fantasies as signals that I really needed to do this, because I had let “feel good now” eating encroach too far onto my usual “feel great later” plan for eating, but I’m not going to lie, that first day completely sucked. It was much simpler than I expected it to be. All those shake packets I was afraid to open made packing for work a breeze. The recipes that came with the program were simple to prepare, had a lot of variety so I was always able to find something appealing to eat, and it didn’t take a lot of time or effort to get it on the table. I seriously felt amazing at the end of Day 3. The headaches were gone, I wasn’t longing to film a Carl’s Jr ad anymore, and all that post vacation bloating and digestive discomfort was completely gone. GONE. I was able to move forward with my program, and I felt lighter, energized, and just all around fantastic. I don’t like liquid cleanses. Give me real food, or get out. I felt like crap after a longer-than-planned break from my healthy eating program. I knew that there was a 30 day money back guarantee on 3 days worth of work (and, ok, a week or two of procrastinating the start of it), and decided that barely even qualified as a risk. Seriously? I’m packed for the week in less than a half hour? Pretty cool! Ow ow ow. Headache! Craving! Give. Me. Baaaaaaaaaacon. Huh. This isn’t so bad. Bacon? Who needs bacon? (OK, I still want some bacon). Look out world! I can’t believe how much energy I have. I feel amazing. And my jeans fit. Holla! But Really, How Effective Is It?